Available now at an incredible Factory Direct discount. Getting ready for a big ride event? The Talon is the perfect choice for riders seeking road bike handling with tri bike speed. 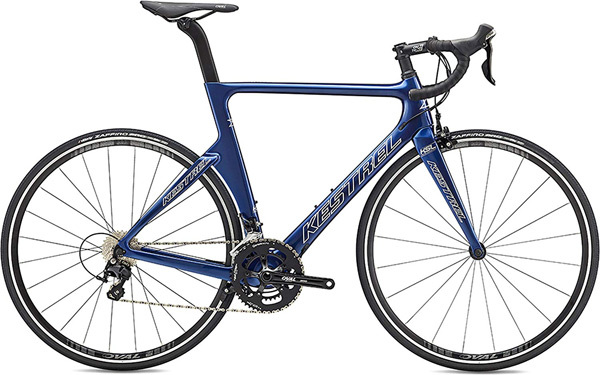 The Kestrel Talon Shimano 105 road bike features a full carbon frame and fork, Shimano 105 11-speed components, and Oval Concepts 327 wheels. 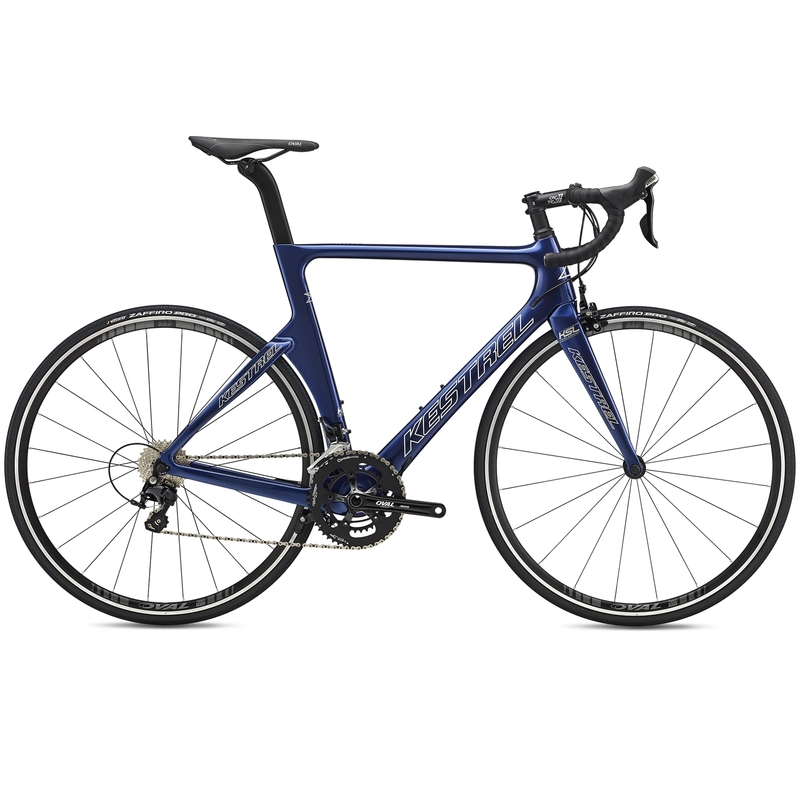 Launched 10years ago, the Talon was one of the first-ever aero road bikes on the market and has been immensely popular ever since for its versatility. Ahead of its time in adjustability, the Talon allows rider to choose either a road or triathlon-style position. The Talon is constructed of Kestrel's super lightweight 800K high-modulus carbon fibers. It's lightweight and stiff, yet also designed to offer a bit more compliance. Designed in the A2 Wind Tunnel, the stays, seat post, and seat tube are aerodynamically contoured; plus, fully internal cable routing ensures clean airflow over the entire bike. Efficiency is paramount to the Talon 105. The Shimano 105 components offer comfortable ergonomics and dependable shifts. Tektro dual pivot brakes apply plenty of stopping power to the low-spoke count Oval Concepts 327 wheels with Vittoria Zaffiro Pro tires. Constructed of Kestrel's Enhanced Modulus Hybrid (EMH) carbon — a combination of 800K and 700K carbon fibers — it's lightweight and stiff, yet also designed to offer a bit more compliance. Designed in the A2 Wind Tunnel, the stays, seat post, and seat tube are aerodynamically contoured; plus, fully internal cable routing ensures clean airflow over the entire bike. Proprietary Kestrel H-Stays – the uniquely, asymmetrically shaped seat stays and chainstays – are designed to improve lateral stiffness and thus power transfer, while also supplying vibration dampening. Kestrel EMS Pro Aero Seatpost allows for the saddle to be mounted in a wide range of positions — more forward for tri use or backward for road. BICYCLING MAGAZINE USED A TALON ROAD FOR THE COVER AND LISTED IT AS A 'BEST BUY'. THIS SEES THE TALON GETTING AN UPGRADED FORK THAT IMPROVES AERODYNAMICS & STABILITY AS WELL AS A NEW SEAT CLAMP FOR EASIER POST ADJUSTMENTS. This Kestrel triathlon bicycle uses the same frame and adds pro-level Tri-bars and position to the mix for absolute speed when you need it. "At Kestrel, there is a philosophy. “If you commit to the process, the results will follow”. The designers at Kestrel recognize that if you focus on only the end results, you are setting yourself up for failure. Just as you as a rider are committed to consistent training, diligent nutrition and racing hard, Kestrel is dedicated to building the best bicycles in the world - bikes that are worthy of your commitment as an athlete to be the vehicle that transfers your training into proven, tangible, results. Each Frame design, every part of every bike, is meticulously designed to make you go faster. You are putting in the time, so Kestrel is putting in their time too. Together, with Kestrel’s respective commitments to their craft, and your abilities as a rider, your riding accomplishments will be lifted to new heights." Since 1987, Kestrel has been meticulously hand-building their carbon frames using the tightest quality control standards in the industry. Their goal - perfecting the science of speed. Kestrel was the first to launch an all carbon bike and thus wrote the book on bicycle performance: weight, stiffness, efficiency, and even the shape of the bicycle itself. With over 20 years of carbon fiber experience under their belts, Kestrel is a name you can feel confident in. Kestrel's geometry has been painstakingly refined to maximize ride comfort and handling grip. Every Kestrel frame comes with a matching, frame-specific fork that's engineered and ride tuned for perfectly balanced handling with a sensitive road feel and superb ride comfort. The Talon has been said to have one of "the most aero frames you can legally race". As in the award winning RT700, the Talon uses Kestrel's unmatched carbon fiber know-how for a superior riding experience. Superb stiffness, superior strength, durability and Kestrel's legendary aerodynamic geometry lend to a road-smoothing ride with precise handling and efficient power transfer. Size-specific tuning optimizes the ride for every size, so you get the same precise handling with a responsive feel regardless of how big you are or where you ride. Other online retailers are selling comparably equipped bikes for $2,500 and up. 52cm - 5'7" to 5'10"
57cm - 6' to 6'3"
60cm - 6'3" to 6'5"
This is a general guide, please consult the geometry chart. If you size up, you may touch when straddling. SPECIAL FACTORY DIRECT PRICE Save Hundreds less than $2499 Comparable bikes!